CB-9 Offices in Crown Heights. Inset: Karen Fleming. 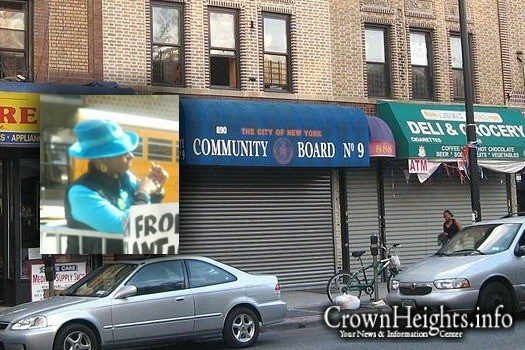 Brooklyn Community Board 9, which represents the Jewish half of Crown Heights along with Lefferts-Gardens, scheduled a vote on a controversial zoning issue which directly affects the Jewish community on the holiday of Simchas Torah, effectively preventing the Jewish community’s participation in the deliberation and vote. One non-Jewish member of the board bravely spoke out against this outrage, and thankfully she was able to prevent the vote from taking place. CB 9 Member Karen Fleming emailed many and objected to the scheduling of the CB 9 ULURP (Land Use) Committee meeting and vote on the evening of October 24, Simchat Torah, which prevented Orthodox Jews from attending. 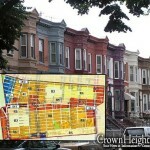 At a previous February 25, 2014 CB 9 ULURP Committee, the Crown Heights Jewish Community Council asked for support to change the zoning district of a few streets in Crown Heights from R2 to R6 to allow a marginal increase in the size of their homes. 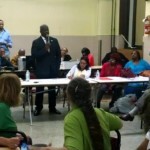 The CHJCC was turned down by the CB 9 ULURP Committee and told to wait for a future rezoning. On March 16, 2015 draft letter approved by members of the CB 9 ULURP Committee ambiguously asks the Department of City Planning to begin a study of the Western half of Community District 9. The CHJCC was tossed a potato latke by City Planning whereby Crown and Carroll Streets from New York to Kingston Avenues were to be included in the study. However, with this latke comes a heartburn. The ambiguity of this Request for a Zoning Study gives City Planning a blank check to develop Empire Blvd. into another Long Island City / Times Square. Say hello to increased parking spot shortages, traffic congestion, tourists, and increased Manhattanization of Brooklyn. If the CB 9 ULURP Committee does a limited spot zoning change for the people of Prospect Lefferts Gardens to go from R2 to R6, they have to go back to the Orthodox Jews who they denied on February 25, 2014, who were first in line, and offer them the same opportunity. I advocate Community Board 9 specifically allowing the good people of Prospect Lefferts Gardens the right to a zoning change from R2 to R6, and conversely, specifically allowing the Orthodox Jews of Crown Heights a zoning change from R6 to R2. There is the trade-off that City Planning is always talking about. One neighborhood in the district gets their upzoning while the other neighborhood gets their downzoning. And then CB 9 can entertain a motion to rescind the previous “Request for a Zoning Study” which was done without any data analysis and meaningful citizen participation. Why even have Community Board committees on Zoning (Land Use), Housing, Transportation and Environmental if City Planning is making the decision and the community is in the dark as to data and numbers. Is this what liberals call being progressive and transparent, or does the Communist Manifesto say that a small group of intelligent individuals shall form an oligarchy (City Planning) to make decisions in a false democracy. If the CB 9 ULURP Committee does a limited spot zoning change for the people of Prospect Lefferts Gardens to go from R2 to R6 with a Request to Study other areas in the district, then what we have is CB 9 Request for a Zoning Study, Part II. It’s the case of another neighborhood, who asks for help from City Planning, but who has to agree to “sign a blank check” which exposes their neighbors to adverse zoning changes in order to get it. A way to form consensus may be to have a Zoning Study limited to only the specific areas which the zoning changes cover, not other areas who did not request the study. An additional condition should be that Borough President and the local City Councilperson for the designated zoning areas sign a letter stating that that they will not sign any ULURP application which is modified beyond what the Community Board specifically supports and limits. City Council follows the recommendation of the local City Councilperson on local matters. In a large district, each neighborhood should respect their neighbors’ local interests and should unite against City Planning forcing a study on a particular neighborhood that does not want it. Neighbors should not step on the backs of their neighbors to get to where they want to go. Monday night’s proposed vote dealt with City Planning forcing another neighborhood (Prospect Lefferts Gardens) who requested a ZONING CHANGE in the past to submit to a larger unlimited ZONING STUDY OR PLAN, which will expose other neighborhoods in the district to negative consequences. 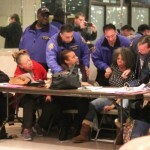 The CB 9 ULURP committee was not able to vote because of a lack of quorum, or a majority of members showing up, in no small part due to Ms’ Fleming’s public shaming of the CB 9 ULURP committee. The entire community should have the opportunity to participate in these decisions which will preserve and/or change the various different neighborhoods in our district. Thanks Karen, for speaking up and being a mensch. You are exactly the type of person that the local politicians do not want on the Community Board. Our infrastructure cannot handle more housing. Everyone will suffer in the long run, and the Real Estate developers will make off like bandits and leave everyone stranded. Takes an hour to get out of Brooklyn. More Housing and it will take two hours to get out of Brooklyn. eric adams and his ally Ingrid always schedule stuff on Friday night crown heights this from people who claim to “know” and “represent” us. If they had the meeting and made a decision, igt would have been a very interesting legal and civil rights case. Wow, so nice to see a person with real values. Someone who stands up for whats right. We need to vote for Ms. Fleming to be our City Council Member or maybe Congress. Thank you Karen Fleming for all your hard work especially or standing up in the face of all politicians and doing the right thing.